Hello, friends, and welcome to Episode number 8 of The Greg Amundson Show. This show has a very, very special place in my heart because on today’s show we are going to introduce, investigate, contemplate and practice the power of one of the most important tools for the modern-day warrior. That tool, my friend, is a tool that will become your constant companion. That tool is your breath. When I think back on my childhood, there were two really key defining moments in my life that took place at Presentation Church in Stockton, California. My longtime priest when I was a young boy attending this Catholic school was a gentleman who is still very influential in my life: Fr. Michael Kelly. Fr. Michael Kelly during mass one Sunday morning said two incredible statements that resonated with my young heart and young mind. In fact, one of these statements became the impetus for my book God In Me. I share this story in the introduction, the profound impact this insight had on my entire life. The first thing that Fr. Kelly said was that, “God is desirous of his sons and daughters developing a heart like Christ. If we want to be like Christ, we have to develop a heart like Christ.” What we now know about the word heart in the Bible is that the word heart means subconscious mind, the mind that runs every detail of our life, yet we may not be aware of it. So essentially, what Fr. Kelly said that day is rather profound. He said that in order to become like Christ, we have to think like Christ. What a profound statement. The other thing that Fr. Kelly said that day was equally profound, equally moving and to this day really resonates in my heart. What Fr. Kelly explained is from the book of Genesis. In the book of Genesis, it says that God took the dust of the Earth and formed the body of man and then breathed into the nostrils of man the breath of life, and the man became a living soul. What Fr Kelly explained is that before God breathed the breath of life into our soul, we were simply a body. Yet, in the moment that God breathed His breath into our lungs, we awoke. We became fully integrated. The mind, the body and what Fr. Kelly said, the soul, all integrated through the breath of God in our life. Well, as you can imagine, there I am, a young boy and I’m just feeling on top of the world. I’m feeling overjoyed, so excited. I think to myself, “Wow! Fr. Kelly, you mean to tell me that I can become like Christ if I think like Christ and that the breath of God is in my lungs? My goodness.” I remember looking over to my mom and dad and my younger brothers all seated there with me in mass that day and thinking to myself, “This is incredible!” I wanted to share that message with the world, and in many respects, that’s exactly what I’m doing today. In order to reach the potential that each and every one of us has, in order to maximize the unique gifts and talents that God bestowed upon us, we have to abide by certain principles. One of those principles is right thinking, known as righteousness in the Bible. The other principle is right breathing. I know oftentimes on the show, I mention a dear friend of mine, one of my training partners to date, one of the most incredibly gifted athletes I have ever known. His name is Robert Guerrero. He’s known in the boxing community as The Ghost, one of the best boxers in the entire world. Robert is preparing for a big fight on July 15th in New York. We are training incredibly hard. He makes daily improvements in his physical fitness. Every Sunday we attend church together at Four Corner Church in Gilroy, California. And a few months ago in church, there was a song the choir was singing. Now, I’d heard this song before. I am obviously familiar with the Bible verse this song is based upon. I just shared it with you from the Book of Genesis. Yet, as I’ve mentioned on numerous occasions, oftentimes what we need is the right circumstance, the right environment, the right context for a message to be fully grasped and understood. And there was something about that day in church, standing next to Robert, singing this song, that it dawned on me the power and the greater implication of this Bible verse for the modern-day warrior. The song is “It’s Your breath in our lungs, so we pour out our praise, we pour out our praise. It’s Your breath in our lungs, so we pour out our praise to You only, God.” Forgive my singing. I’ll tell you what. That song is running like background music in my mind every time I work out, that song. It’s the same for Robert. That’s the background music in our mind, because think of the greater implications of that song and that Bible verse and that message from Fr. Kelly. Every time you draw in a deep breath, that’s the breath of God in your soul, my friends. What power you possess through the breath of God. It’s not that you’re breathing in; it’s that God is breathing in to you. Wow! 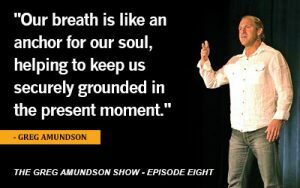 Today’s entire episode on The Greg Amundson Show is dedicated to the breath. Understanding the breath, maximizing the effectiveness of the breath, essentially becoming, as my dear friend Dan Brule would say — the author of a book I highly recommend called Just Breathe: Mastering Breathwork for Success in Life, Love, Business and Beyond — as Dan Brule says, “We need to become a lover of our breath.” A lover of the breath! And of course there’s so much to love because that’s the breath of God flowing into our mind, into our heart, into our soul, into every cell of our body. In my book Firebreather Fitness, in Chapter 14 there is an entire section dedicated to really investigating this power that we all posses every time we breathe in and every time we breathe out. That power is there whether or not we’re aware of it. The beauty of the breath is that, remember, the presence of God is always there whether or not we are aware of it. Therefore, as we develop awareness of the breath, we simultaneously begin to develop awareness of God. The breath allows us to fully integrate the very presence of God, especially when every breath that we partake in resonates with us at the deepest level of the fact that that is the breath of God flowing into every cell of our body. What I thought would be special is to go right to the source. I want to open up Firebreather Fitness to Chapter 14 and read with you some of the key paragraphs from this particular chapter on the power of the breath. Here we go, my friends. The most simple yet effective techniques to hone strength and resiliency are those aimed at stress reduction. Combating stress in order to relax the body and quiet the mind builds your spiritual strength and aids you in every endeavor of your entire life. The majority of the great spiritual texts and disciplines teach that the fundamental cause of suffering is the mind’s tendency to either regress to the past or project itself into the future. The solution, therefore, is to discipline the mind to remain centered in the present moment. During meditation, the tendency of the mind is to leap out of the present moment becomes extremely apparent. Indeed, we find that holding the attention on the present moment can seem harder than the most demanding physical workout. In many respects, as my dear friend Mark Divine would undoubtedly agree, learning to work in is more challenging and much more important for the modern-day warrior than learning to work out. In my military and law enforcement career, I noticed how easy it was for my mind to project itself into the future and to worry about what might happen. In these moments, because my mind was resting on a future creation that had no bearing in the present moment, I was unaware of my body and my breath. As a result, my body was tight and my breath was shallow, which only exaggerated the mental sensations I was entertaining. Learning to remain present with the mind, continually realigning to the body and the breath is a powerful practice that can have a profoundly positive effect in every department of your life, be it your workout, your relationships or your career. Remaining present helps you gain perspective on what is permanent versus what is temporary. When we become still and silent and begin to witness our thoughts, we awaken the part of our consciousness I refer to as The Great Witness. This ability to create a little bit of space between our thoughts and our great witness helps us discern when we are focusing our attention. You see, your mind, it’s like a giant magnifying glass, and what you focus on will therefore tend to increase in your life. Let me say that one more time. It’s so important, my friends. Your mind is like a giant magnifying glass. And, here’s the key, what you focus on will therefore tend to increase in your life. When you focus on a problem, the problem only increases. The real insight here is that the majority of the time, the problem that we are focusing on is our perception of a situation and not the situation itself. In other words, it’s our thinking that determines the quality of what we are seeing. And when we change the way we look at something, what we look at begins to change. Everything begins in the temple of our mind. Again, let me reiterate that for you, my friends. If all you took away from today’s episode was this, it’s a golden nugget. It’s our thinking that determines the quality of what we are seeing. And when change the way we look at something, what we look at begins to change. A strong, spiritual practice that helps cultivate your ability to meet and greet stress in the present moment as it arises in your consciousness is the breath. Engaging stress as a warrior means dealing with it on the field of battle at the moment the stress presents itself. In this context, the stress can turn into a strengthening experience and an opportunity to discipline yourself to remain in the present moment. Breathing, my friends, breathing is one of the most valuable tools you have at your disposal to help you remain in the present moment. The practice of watching your breath teaches stability, and helps the mind discover what action can be taken in the present and what you illusions of the future or memories of the past may need to be resolved or perhaps, more importantly, forgiven. When I teach yoga, when Mark Divine teaches yoga, when Dan Brule teaches yoga, when Rolf Gates teaches yoga, when every teacher teaches the practice of yoga, we teach the student to bring awareness to the four parts of the breath. Here’s where it really gets exciting. Here is where we really develop the warrior’s ability to understand the power of the breath. Every time you breathe in, even though you may not be aware of it, there are four distinct moments because there are four distinct parts of every breath that you take: the inhalation, the retention of the breath after inhalation, exhalation, and suspension of the breath after exhalation. Now, let’s look a little bit closer at these four parts of the breath and the quality that determines the benefit of each of these distinct moments. The in-breath, the inhalation, should be long, slow, subtle, deep, and the inhalation should evenly spread throughout the entire body. Isn’t that beautiful? Imagine that every breath that you take in is evenly spreading throughout every cell of your body. And remember that every breath in is the breath of life, the breath of God flowing into your body. There’s no need to rush the inhalation. Instead, savor the length, the duration of every inhalation that you take. The in-breath draws energy from the atmosphere into the cells of the lungs and rejuvenates and restores the life force within you, by retaining the breath once it’s drawn in, the energy if fully absorbed and evenly distributed throughout all systems of the body through the circulation of your blood. The slow release of air, during the exhalation carries out and removes accumulated toxins, both mental and physical. By pausing after the out-breath to a level of comfort unique to every moment, all mental stresses are purged away and your mind is therefore naturally drawn to the present moment. As you continue to draw your attention to the inner movement of the breath and become sensitive to each of the four parts of the breath, or as my friend Dan Brule would say, you become a lover of the breath and each part of the breath. It essentially becomes impossible for your awareness to remain attached to the external senses, the past or the future, because you are so absorbed with every moment of the breath. Even one breath, my friend, this is the key insight, even one breath taken in absolute present moment awareness is enough to release the grasp of the past or the tempting illusion of the future. Meditation on the breath is a powerful step in the withdraw from the external engagement of the mind with the memories of the past or the tendency to plan, wrestle with, or even be remotely concerned for the future. Wow. The power of the breath, my friend. It is absolutely amazing. It is one of the greatest tools for the modern-day warrior. Josh was a platoon leader in Iraq when he was hit by a sniper’s bullet. Josh was clinically dead for 15 minutes. Josh came back to life, had a miraculous recovery and then volunteered to go back into combat and finish his tour of duty with his men. Josh now travels all around the nation teaching the principles of the modern-day warrior, which have more to do with the mind and the spirit than with the physical body. Indeed, Josh embraces the principle that Mark Divine and I teach of working in rather than focusing on working out. Well, let’s pose that question to none other than the breath master himself, Dan Brule. In conversation I asked Dan that same question. I said, “Dan, how much time everyday should I be devoting to my breath practice?” I have a good understanding of my physical practice. I know approximately how much time I should be investing into my CrossFit workout, into my martial arts training, into my yoga practice. I have a good understanding of how much time I should be spending in meditation, in communion and prayer and intimacy with God. How much time should I spend on my breathing practice? And here’s what Dan said. He said, “Greg, it’s really simple, brother. All you need to take is one mindful breath a day. One mindful breath taken every single day for the rest of your life constitutes a complete breathing practice.” Wow. Isn’t there some peace in that? What I’m proposing to you, my friends is that if you take one mindful breath a day, with full awareness, passionate commitment. If that breath that you take in becomes an opportunity for you to experience the very presence of God flowing into every cell of your body, that in and of itself constitutes a complete breath practice. And we can begin to see the genius of all the great spiritual texts and historical practices in welcoming and inviting a breathing practice. The breath essentially becomes the moment of integration between the mind, the body and the soul. The breath anchors us to the present moment. The breath rejuvenates the body. The breath restores the tranquility of the mind. And the breath allows the awareness of God to resonate in the forefront of our consciousness. We gain intimacy, communion and present moment of awareness of the presence of God with every breath that we take when every breath we take is taken with mindfulness, with concentration, with complete and utter awareness. When we tap into the great witness within us, and when that great witness within us is fully aware of the breath, we achieve the peace and the presence of God. Well, my friends, as you undoubtedly know by now, I am a big believer in, as my friend John Hackleman would say, there is no time like the present moment. NTLP, baby, as John Hackleman would say. And for those of you that don’t know John, John is the owner and founder of The Pit Fight Team. You may know John by one of his most accomplished fighter athletes, Chuck Liddell, former UFC Champion. Well, John Hackleman is Chuck Liddell’s coach. And one of the famous statements of John Hackleman is, “When you want to do something, when you want to effect change in your life, there is no time like the present moment.” And one of the mantras of John is, “NTLP, baby.” No time like the present. Well, it turns out that the breathing practice that Mark taught me that day in Encinitas, which he refers to as box breathing, was the exact same breathing practice that Col. David Grossman taught me in Quantico, Virginia nearly four years earlier. David Grossman refers to the practice as combat breathing. Mark Divine refers to the practice as box breathing. When I teach this practice, I refer to it as warrior breathing. Dan Brule refers to this practice as spiritual breathing. It is known by many names, yet the practice remains the same. My friends, during this practice, my recommendation to you is to utilize the nostril breath. Nostril breathing when combined with the combat breathing or box breathing or spiritual breathing or warrior breathing technique that I will teach has several additional benefits. The hair follicles in the nose help to either warm or cool the breath before the breath enters your lungs. The nostril breath also tends to pull the breath into the lower diaphragm filling the lungs from the bottom to the top. Finally, the nostril breath triggers the parasympathetic nervous system, essentially communicating to your brain to rest, digest. It triggers the emotions of tranquility, peace and ease in your mind and body. So, my friends, let’s begin. Whether you’re seated or standing, take a moment to ensure that your spine is straight. Roll the shoulders back. Open the heart and the space around the heart. Imagine that you’re lifting the crown of your head up towards the heavens. Then begin by letting all the air out. Exhale through the nose and we begin. Inhale through the nose. Two. Three. Four. Hold the breath. Two. Three. Four. Exhale through the nose. Two. Three. Four. Hold the breath. Two. Three. Four. Inhale through the nose. Two. Three. Four. Hold the breath. Two. Three. Four. Exhale through the nose. Two. Three. Four. Hold. Two. Three. Four. Inhale through the nose. Hold the breath. Exhale through the nose. Hold the breath. Last round. Deep breath in. Hold. Slow breath out. Hold. Now take a deep breath in, followed by a slow breath out. Notice how you feel after four rounds of box breathing. Notice how you feel after four rounds of spiritual breathing, combat breathing, warrior breathing. As I mentioned, this breathing practice, although it is known by different names, follows the same principle, follows the same methodology, follows the same system. That, my friends, can be the beginning of your breathing practice. The breath that we just took together, let that be the NTLP in your breathing practice. No time like the present moment. The present moment is upon you. You’ve just engaged in your first round of breathwork, of spiritual breathing, of warrior breathing, of combat breathing, of box breathing. You’ve just embarked upon what may very well be one of the most important paths that you embark upon on the warrior quest, on the spiritual journey of your life, my friends. I want to conclude our episode today on breathing with a wonderful story from the warrior tradition that brings to life and enhances what we are trying to accomplish through the breath. My friends, as we close our episode today, I ask you to take a moment to contemplate where that story resonates in your mind, in your heart, in your soul. Pose that question to you without judgment, “Where does that story hit you?” In the mind, the body, and the soul. Which character in the story are you in this moment? Are you the rock? Have you not yet begun the breathing practice? Are you the sand? Are you the ocean? Are you the air? There is no time like the present moment, my friends. Begin today. Begin the journey of the breath practice today, my friends. Let today be the first day of the beginning of your life. My friends, my dear, dear mentor in yoga, breathing and meditation, Rolf Gates, he is the author of a book I recommend called Meditation from the Mat. He ends every yoga practice with a beautiful prayer. To honor Rolf, I’d like to offer this prayer to you, my friends. I pray that you would be safe, that you would be happy, that you would be healthy. I pray that you would discover your freedom. I pray that you would find enduring peace. And I pray that you would walk through the world with ease. May God bless you, and watch over you, and I will speak to you very soon back here on our next episode together of The Greg Amundson Show. Take care!